ARC Rotary Files fit where other files won't. The ARC Rotary File is a double-faced unit that rotates easily to provide access to both sides. 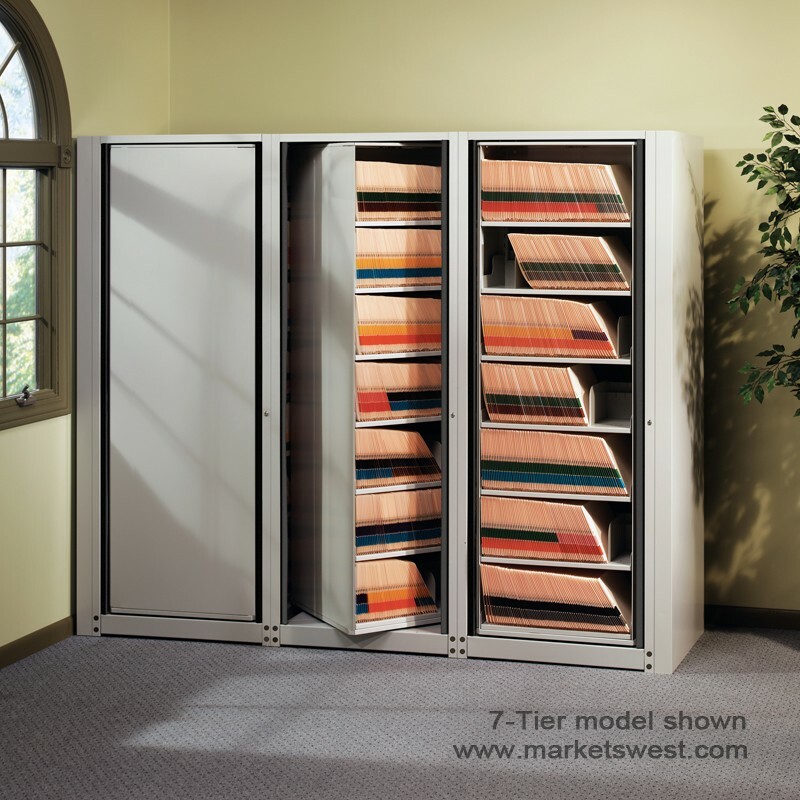 Minimal access space is required because no doors or drawers protrude into aisles. Yet you can access twice the amount of material from a single vantage point, compared to conventional filing solutions. ARC Rotary Files fit where other files won't. The ARC Rotary File is a double-faced unit that rotates easily to provide access to both sides. 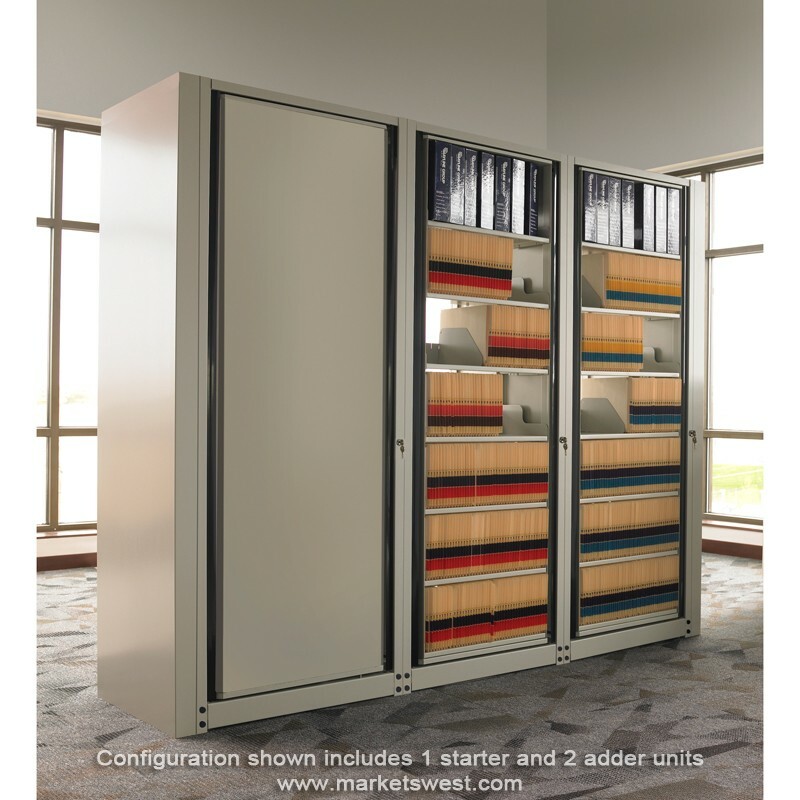 Minimal access space is required because no doors or drawers protrude into aisles. 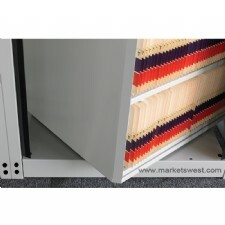 Yet you can access twice the amount of material from a single vantage point, compared to conventional filing solutions. 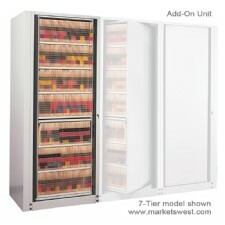 There are no cumbersome foot pedals to operate, a slight push is all it takes to rotate cabinets. 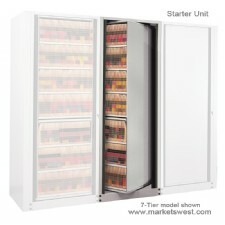 Each unit has a standard lock to maximize security and peace of mind. 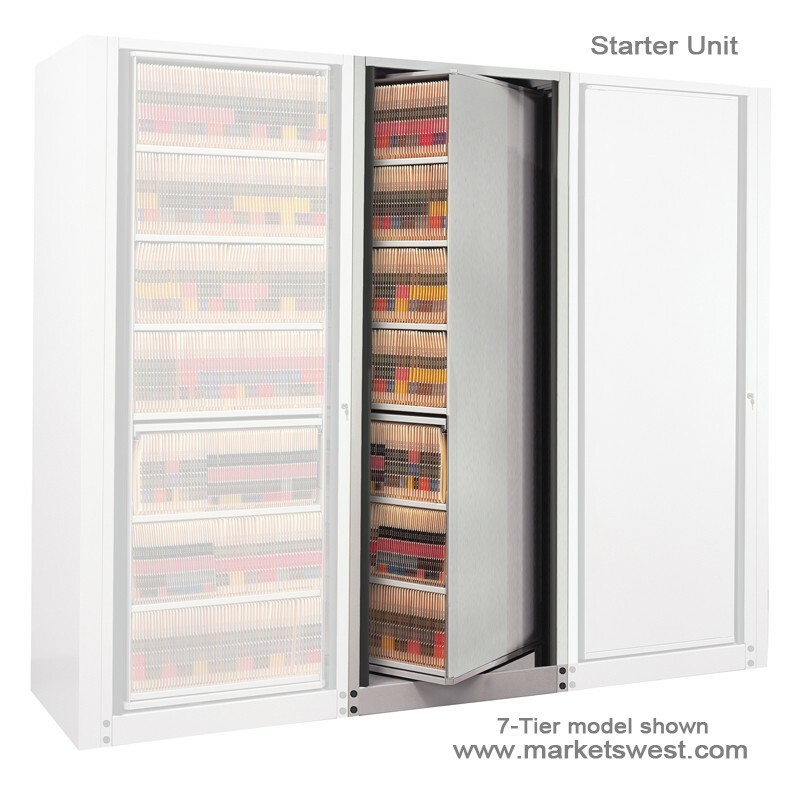 The complete starter includes everything needed to house a filing system including the specified number of shelves and dividers. Note: Image shows product in 7 tiers; this product has 6 tiers. 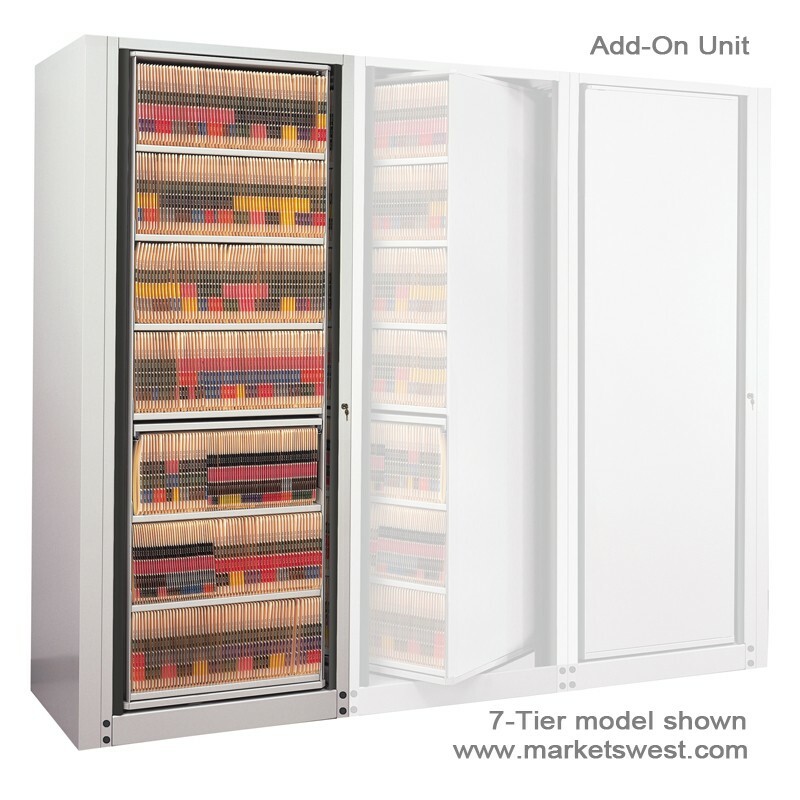 Choose from six pre-configured units or specify your own storage variations. Universal base lets you expand system in either direction. Options include reference shelf, cantilevered slotted shelf, roll-out drawers, roll-out shelves, roll-out hanging file frames and pass-through shelves. 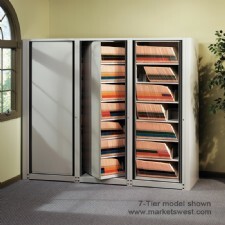 Files are equipped with a rotating mechanism that self-locates every 90°, plus a standard security lock. 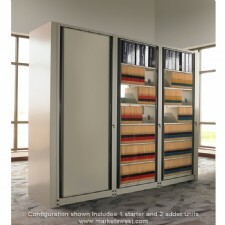 Optional pull-out reference shelf eases file notations. Cantilevered shelf is adjustable on both sides of unit. Roll-out drawers are available in five heights. Weight:Starter Unit ..... 403 lbs. Add-On unit ...... 347 lbs. To order a fully assembled unit, add the letter "B" after the letter "C" in the part number (e.g. ARCB244035). PLEASE NOTE: Due to discrepancies in computer monitor displays, we can not guarantee the accuracy of these colors. 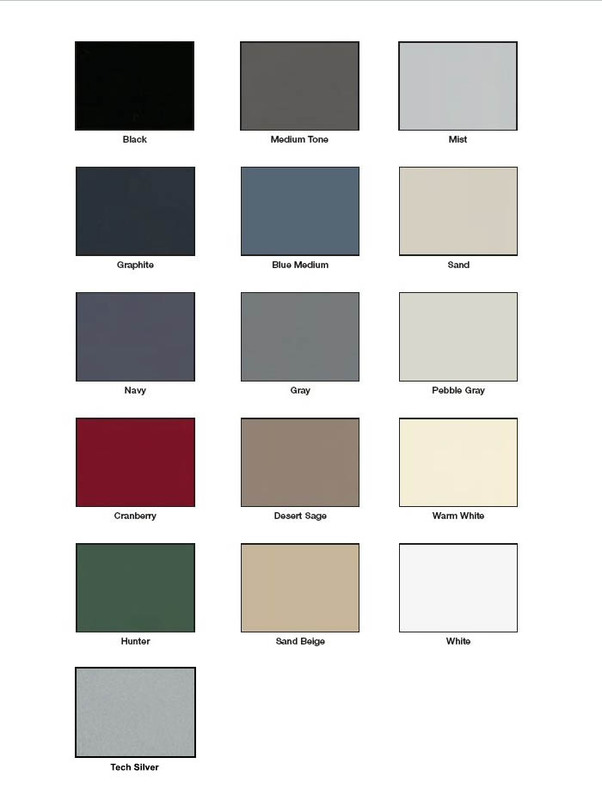 If in doubt, please request a physical color sample.